CubeSats represent today a promising solution for low-cost interplanetary missions. Ground segment operations, however, still represent a major challenge for interplanetary CubeSats since operations costs for deep-space travel require the use of large, costly ground stations, and extensive workforce. 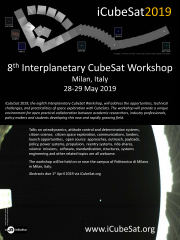 In view of potential applications of CubeSats for small-body exploration, the present work proposes a 3U CubeSat mission capable of autonomously flying by near-Earth asteroids. Three main subjects of interest are addressed in this study: (1) low-ΔV impulsive trajectories are designed according to current propulsive capabilities, (2) the flyby accuracy that can be achieved by CubeSats flying autonomously is estimated, and (3) a 3U CubeSat design is proposed (including its science payload) and the potential scientific impact of the mission is discussed. Short-duration missions (<150 days) are considered in this study to confine the demanding implications of extensive, deep-space travel (e.g., radiation effects), and piggyback opportunities from a larger spacecraft around the Sun-Earth Lagrange points are leveraged to reach far destinations. The trajectory design analysis is performed considering the gravitational attractions of the Sun and the Earth, and potential asteroid flyby opportunities between years 2019 and 2025 are identified. Monte Carlo simulations are implemented to determine the flyby altitudes that could be achieved through autonomous navigation and an additional trajectory correction maneuver prior to the flyby (i.e., using observations of the asteroid instead of communicating with ground stations for navigation support). Finally, the components and science payload for a 3U CubeSat are selected using primarily off-the-shelf components, and the potential scientific merit of the mission is evaluated based on the attainable flyby altitudes and allocated science payload. Preliminary results show that at least 10 asteroids could be reached by an autonomous 3U CubeSat between 2019 and 2025, and 500–1000-km flybys could be achieved considering the limited performance of current CubeSat sensors and actuators. Medium spatial resolution could be accomplished by an on-board camera (~30 meters/pixel), and spectroscopy observations could also evaluate surface composition, mineral abundances, and space weathering effects. CubeSat missions could consequently cost effectively support current efforts in the asteroid mining industry (e.g., to identify potential targets of interest), or in the scientific community (e.g., to understand the formation of the Solar System). Ultimately, this study demonstrates that CubeSats can actually provide a real low-cost solution for small-body planetary exploration, and reduce not only the development costs of missions, but also the costs associated to interplanetary ground operations.